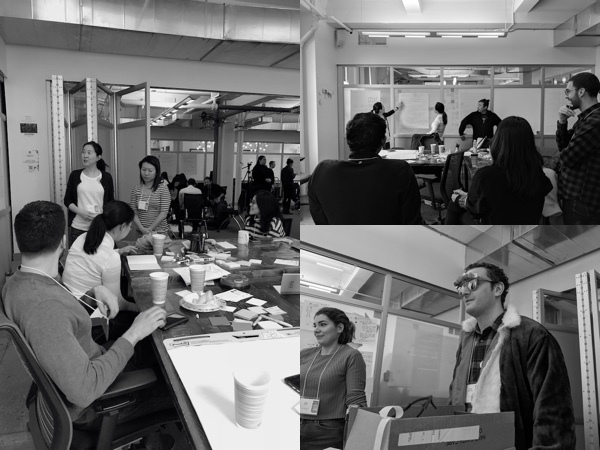 The NYC Service Design Jam is a yearly gathering of people interested in using a human-centered design process to solve problems. Participants are broken down into teams and team members have to agree on the interpretation of a shared prompt. Afterwards, each team proceeds to solve for that problem over the course of 48 hours. 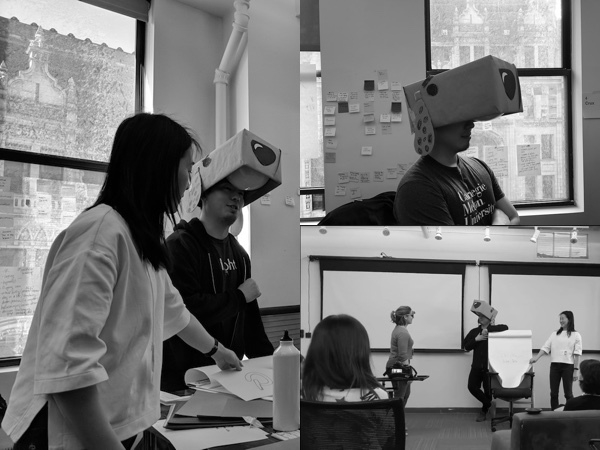 It is a fast-paced, energetic, and fun-filled weekend with service design at its core. The 2018 global prompt was a video snippet of graffiti-like painted words flashing one after the other to the tune of a record scratching jig reminiscent of ‘80’s breakdancing: “Yes No Yes No Yes No Maybe No Yes”. Based on the prompt, our team decided on solving for decision-making. Our statement: How might we facilitate any decision making process so that people feel secure and comfortable. Success looks like reduced anxiety about decision making. Glasses paired to your mobile device that project an advisor who will help a user through a typical decision making process. Envisioned technologies to be used are the Internet of Things and Augmented Reality. As animals, particularly Man’s best friend, are a great source of comfort to most humans, our team agreed on Buddy, the AR canine advisor. Brainstorming each team member’s interpretation of the global prompt before agreeing on a way forward for this Service Jam. Narrowed down an issue that we could solve within the constraints of the Service Jam. With the challenge in mind, we set out to interview and observe every day people about decision making. 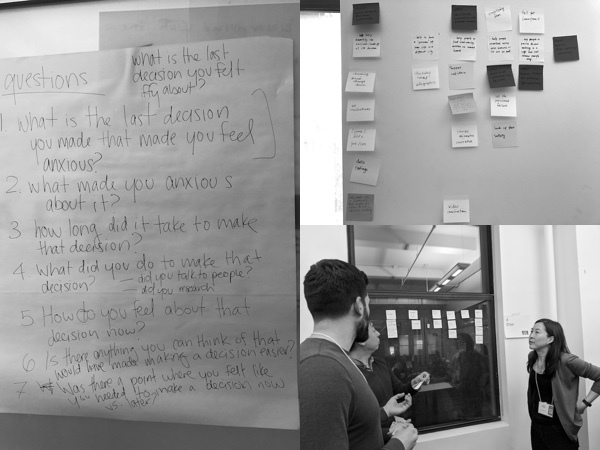 We regrouped, shared our findings, found common themes, and mapped the user’s journey through decision making. Brainstormed about 15 ideas to solve the problem. Agreed on 4-5 ideas to further explore and sketch. 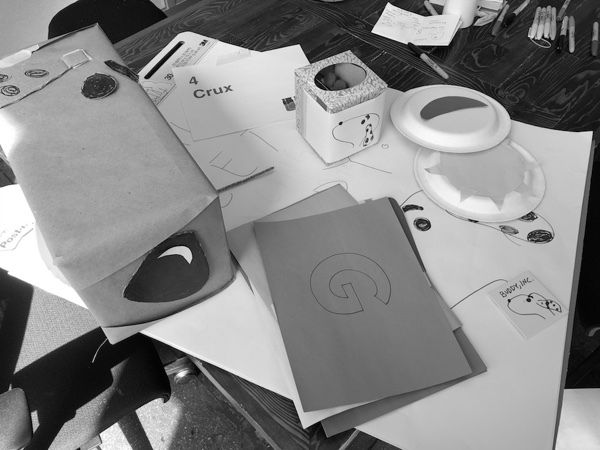 Developed prototypes and scenarios for two of those ideas. Narrowed down to one touchpoint that we could prototype and present. 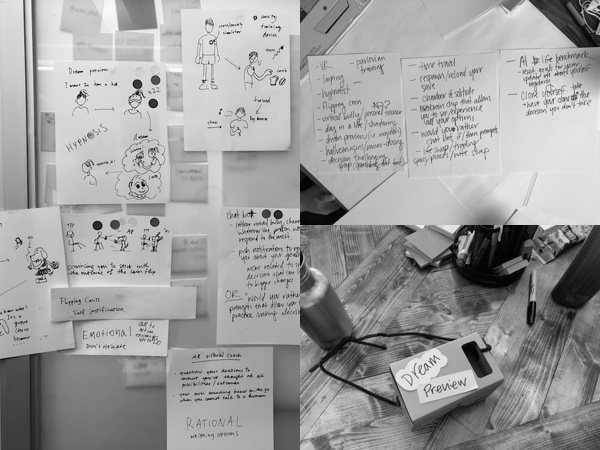 For the challenge statement, we exchanged pinup sessions with another team to give each other feedback and help each other narrow down to a feasible prototype. For the research part, we tested our interview questions on two mentors. We adjusted the wording and added questions based on their feedback. For the prototyping part, we tested our solution on two different mentors prior to presenting to all the Jammers and three guest judges. Judges thought our prototype could have immediate potential for development as it uses current technologies. It also has a very specific and narrow focus: accessing and compiling existing user data to help them weigh the pros/cons of making a decision. View the three-minute video pitch on the Global Jam website.